What is an "organic" molecule? The word "organic" has a very different meaning in the sciences, than it does in the grocery store. In the grocery store "organic" usually means that the food item is free of pesticides, artificial preservatives or genetic modification. In the sciences, organic molecules are the molecules required for life! These molecules can be identified by their long chains or rings of carbon atoms which usually also contain a combination of hydrogen, oxygen, and nitrogen. Lipids contain carbon in a chain form. ​ Assembling larger molecules from smaller molecules is a common theme in microbiology. These types of reactions are categorized as SYNTHESIS reactions. ​ One of the more common ways for a synthesis reaction to occur is a dehydration or condensation synthesis reaction. In these types of reactions, a hydroxyl group (OH-) and a hydrogen (H+) will be removed from the subunits and water is released as a byproducts. As this occurs, a strong covalent bond is formed. For example, in a dehydration synthesis reaction, or more simply "a dehydration reaction", the 2 monosaccharides, glucose and fructose, bind forming the disaccharide, sucrose and 1 water molecule is produced as a byproduct. Sucrose is what we think of a table sugar, that we would purchase as the grocery store. Many biologically-relevant macromolecules are polymers. Polymers are long strings composed of repeated singular units called monomers. The terms monomer, dimer and polymer are general terms that can be applied to any units that can undergo polymerization. DNA and RNA are polymers of nucleotides. ​ Examples of these monomers and polymers can be found in the sugar you might put in your coffee or tea. Regular table sugar is the disaccharide sucrose (a polymer), which is composed of the monosaccharides fructose and glucose (which are monomers). If we were to string many carbohydrate monomers together we could make a polysaccharide like starch. The prefixes “mono-” (one), “di-” (two),and “poly-” (many) will tell you how many of the monomers have been joined together in a molecule. Each of these types of macromolecules performs a wide array of important functions within the cell; a cell cannot perform its role within the body without many different types of these crucial molecules. ​ Cells are immersed in an aqueous (water-like) environment. the molecules both inside and outside of cells are situated in a water-based (i.e., aqueous) environment, and all the reactions of biological systems are occurring in that same environment. 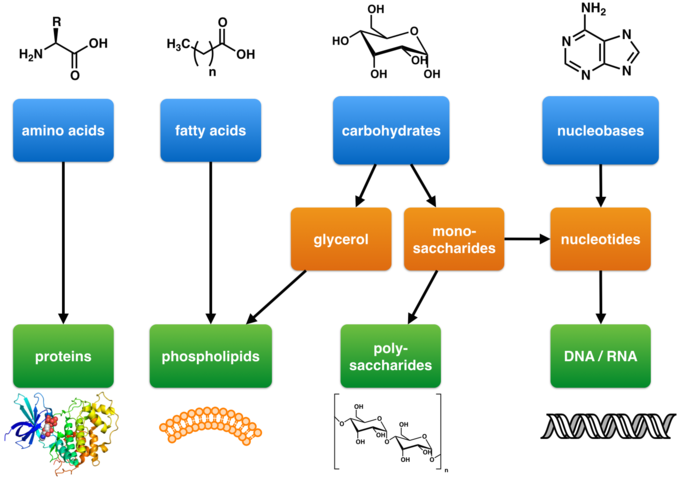 Carbohydrates, proteins, and nucleic acids are built from small molecular units that are connected to each other by strong covalent bonds. 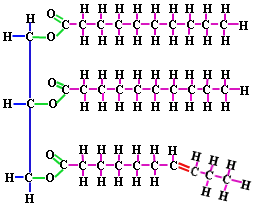 The small molecular units are called monomers (mono means one, or single), and they are linked together into long chains called polymers (poly means many, or multiple). Each different type of macromolecule, except lipids, is built from a different set of monomers that resemble each other in composition and size. Lipids are not considered polymers, because they are not built from a set of repeating smaller subunits that are very similar in structure and composition. You can also break apart macromolecules into its smaller units. This may be done to release the potential energy in a chemical bond, or to re-purpose the smaller building blocks for forming other molecules. A common way that macromolecules are broken down in the body is through a DECOMPOSITION reaction.